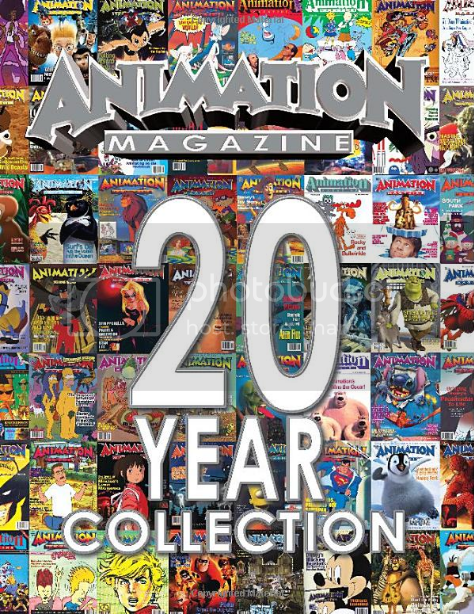 Product Description (from Amazon.com): This 20-year compendium of the leading artists, creators and animated features, TV series, shorts, games (1987-2007) includes articles by and interviews with the field's leading stars. Top-quality full-page reproductions of all the magazine's covers are accompanies with useful charts, statistics and indexes about the animation and vfx arenas. Disney/Pixar chief creative officer John Lasseter, French director Sylvain Chomet, Aardman Animations co-founder Peter Lord, voice artist Nancy Cartwright (Bart Simpson),independent animators Bill Plympton and John Canemaker, vfx guru John Knoll, animation experts Leonard Maltin and Charles Solomon are some of the book's featured artists and writers. The book also features pieces by Animation Magazine founders Terry and Jean Thoren. GMD mention: Briefly on page 27 and in the back Index of animated films for 1986 on page 276 (with a color photo of Basil saving Olivia inside the clock tower of Big Ben). Where can it be purchased: Animation Magazine Official Site, Amazon.com (Hardcover).